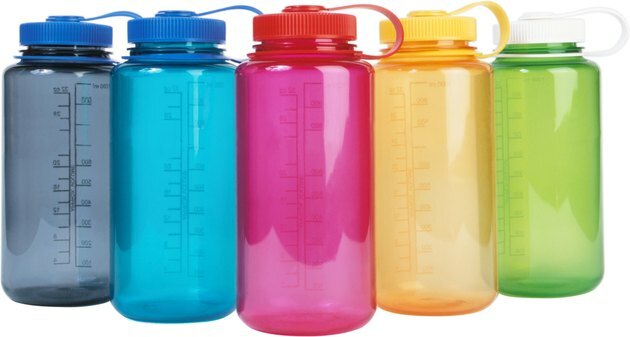 A lot of people use plastic drinking bottles. Unfortunately, though, sometimes mold grows on plastic drinking bottles when they haven't been cleaned properly. There is no need to be concerned, however, as there are several options for removing mold from plastic drinking bottles. Fill the plastic drinking bottle with warm water and dish soap. Replace the top and shake vigorously. Drain the water. Rinse with fresh water. Pour undiluted white distilled vinegar into the water bottle. Use a dish washing scrub brush to scrub the plastic bottle clean. Follow with fresh water and allow to air-dry. Put two drops of tea tree oil into water bottle and two cups of warm water. Replace top and shake bottle. Open the bottle and scrub off the mold with a dish washing scrub brush. Pour out the tea tree oil solution and rinse bottle with fresh water. Allow to air-dry. Pour one-half cup of 3% hydrogen peroxide into the plastic drinking bottle that has mold. Swirl plastic bottle to distribute hydrogen peroxide. Let sit overnight with the top off. Pour out the hydrogen peroxide and rinse with fresh water.